It’s harvest time for my pear tree! I finally figured out what kind of pear it is – D’anjou. It’s a hard pear that is picked in September before they’re ripe, but still “mature” or when the pear is tilted sideways and comes off the tree easily. 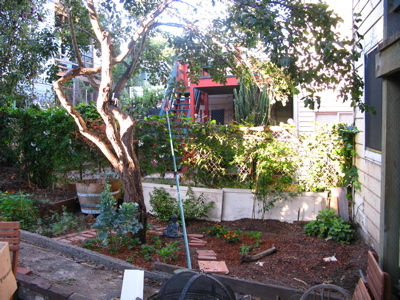 The total harvest this year is three bushels, one of which was compost. One bushel has been shared. I just picked the second bushel this evening, with my neighbor’s fruit picker. The pears seem better than last year. I don’t know if it’s because they’re actually better than last year, or because I know what they are this year. It’s probably a little of both, and a good illustration of the permaculture principle on yield, stating that the yield of a system is only limited by the information and imagination of the designer. I have figured out two successful recipes for the pears. Slice 8 pears and boil them for 30 minutes. Drain. Puree in a food processor. Stir in ½ cup orange juice concentrate and some grated nutmeg. Slice pears fairly thin, enough to fill a pan. Pour a little water or pear juice or orange juice over them, so that there’s about ½ inch in the bottom of the pan. Sprinkle with sugar and nutmeg, and a little flour. Bake til bubbly, about 30 minutes. Meanwhile, mix the crisp topping up with your hands: 1 softened stick butter, some oats, flour, sugar and cinnamon. You want the topping to be kinda crumbly, sticking together in marble sized bits. Take the pears out of the oven and sprinkle on the topping. 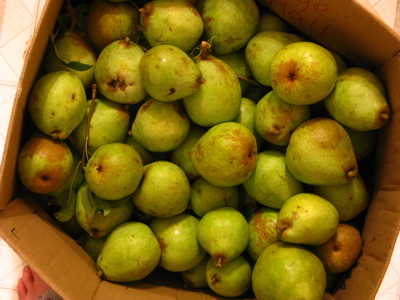 I’m going to try Jana’s pear chutney this weekend, and maybe do a little more canning. Still, I’m going to have to be really creative, industrious AND generous to make sure these pears maximize their potential. Does anyone want some pears? The rest of the garden is happy too. Two of my Sweet 100 Cherry Tomato plants are over six feet high (tied to the ladder), and producing delicious little gems. My green bean plant is about done, and yielded me about five quarts of beans over the last two months. The basil, sage, cilantro and parsley. Hopefully, I can keep the cilantro from bolting so quickly this time. I have peas sprouting. I’ve planted winter kale, asian greens, chard and some other spinach type edible. We’re still getting a few strawberries. The long pole leaning on the fence is the fruit picker. 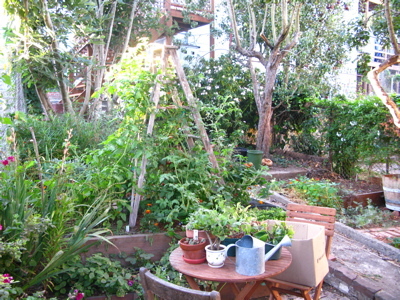 This entry was posted in Recipes and tagged garden, permaculture, precita. Bookmark the permalink. Another great thing you can do with pears is this pear coffee cake. We get pears from folks who have pear trees but don’t pick the fruit. There are numerous variations on the recipe below.